Emigrate to Australia was the wish of Jane Page’s father, a British sea captain in the 1830’s. 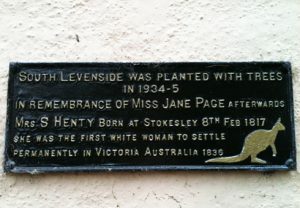 Emigrate to Australia: where Miss Jane Page, born in Stokesly, North Yorkshire, was the first white woman to settle permanently in Victoria. In 1832, aged 16, Jane Page left Stokesly in North Yorkshire UK and emigrated to Freemantle with her family. Her father was a sea captain with the East India Company who reported that he was ‘much pleased’ with the colony in Victoria. In 1836 Jane arranged to marry Stephen Henty to whom her mother had brought a letter of introduction from England. Jane travelled from Victoria to Tasmania to meet her future husband and his family at Portland Bay. Stephen and his brothers Edward and Frank were the first European settlers in Victoria. Stephen, a pioneering character, has already travelled extensively in Europe and the Middle East in the 1820’s and 1830s’. Jane – described as a lively and courageous woman – then led a colourful though tough life in Australia. It was a time when living conditions were basic and Jane faced regular hardships and dangers. Jane’s husband Stephen, a passionate explorer, spent many months away from home travelling through the vast interior or Australia. Stphen was the first white man to stand on the border of the Blue Lake at Mount Gambier. Jane later wrote that: “Despite his many narrow escapes Stephen never killed a native, which was a comfort to him”. Jane’s son Richard was the first white male born in the colony of Victoria. Stephen and Jane prospered in Australia. They established the first stations in Victoria, owned property and did well with the raising of sheep and selling of fine wool. Stephen was wealthy enough to travel frequently to Melbourne and attend society balls, hunts and formal events. Stephen and Jane even played host to royalty such as the Down Under tour of the Duke of Edinburgh in 1867.